The Project menu gives you access to the main features related to the general operations in TWS. Solution Options Opens the Properties window for a solution. Project Options Opens the Properties window for a project. 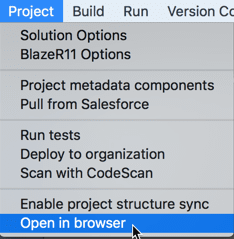 Project metadata components Opens the Project metadata components window. Pull from Salesforce Opens the Pull changes from Salesforce window. Run tests Opens the Run Test window. Deploy to organization Opens the Deploy components to organization wizard. Scan with CodeScan Runs checking the project files against the CodeScan rules. Enable project structure sync Allows enabling / disabling synchronization of the project structure. Open in browser Opens your whole organization in your browser.